Choosing the right commercial door or door systems for your loading dock, storage area or anywhere else can be a difficult task. There are many, many options out there—from basic aluminum doors to rolling doors and sectional steel doors. However, if you need the ultimate in thermal efficiency, wind load resistance and air infiltration, one of the Thermacore doors from the Overhead Door Company of The Meadowlands is an ideal choice. Thermacore doors and sectional Thermacore doors are one of the best ways to keep temperatures steady in you storage area. In certain industries, this can not only save money on your energy costs, it can help prevent merchandise from damage due to a drastic change in temperature. The Thermacore sectional garage doors at the Overhead Door Company can be customized to fit your particular needs. The doors are available in sizes up to 40’ 2” wide and up to 32’ 1” tall. The continuous hinge attachment strip not only makes installation easy, but also if you find you need repair work in the future, the repairs can be done on the spot. When you are ready to look into the installation of Thermacore doors, knock and lock doors or any type of sectional garage door for your business, give us a call or contact us online. 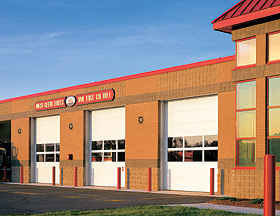 Our team of overhead door experts is always ready to work with you and help you make the right decision when it comes to commercial garage doors. Remember, if you are interested in learning more about rolling doors, commercial operators, any type of sectional doors or other overhead door elements, check out further posts from Overhead Door Company of The Meadowlands.